The latest CFSv2 data has been downloaded and processed by the expert team at ExtendWeather and the word for the month of February is rain. 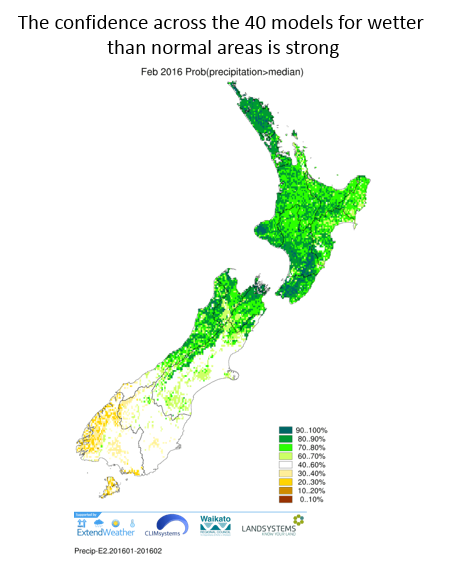 February is typically the driest month across most of New Zealand. Summer has typically arrived for most places with warm days, beautiful mild evenings and calm weather. But this February could be a little bit different. 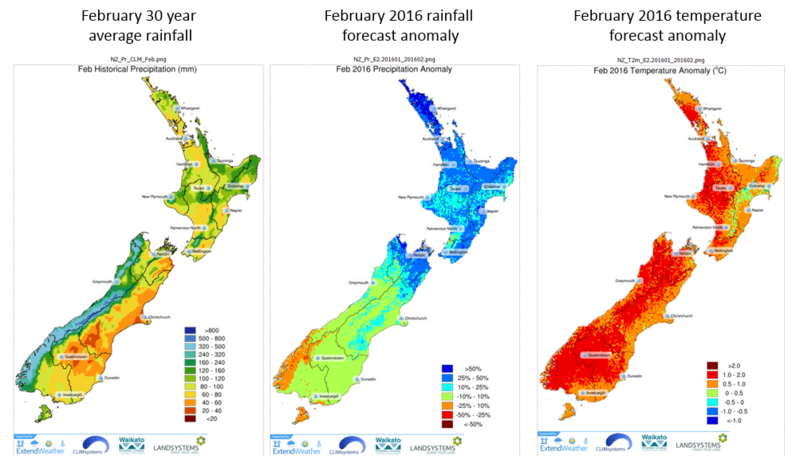 There are a number of factors supporting a wetter than normal February for the North Island and the far north part of the South Island. The remainder of the South Island should see near normal precipitation for the month with slightly drier conditions in Fiordland, but that is from a rather high historical base of between 320 and 500 mm for the month. 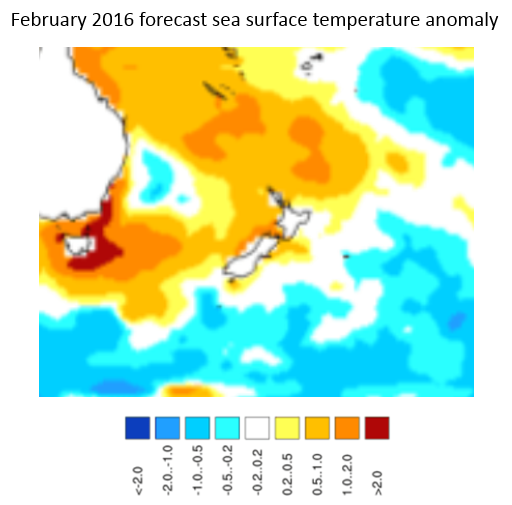 First of all ocean temperatures for February are forecast to be slightly warmer than normal to the north and west of the North Island. With seas between 0.5 and 2.0 degrees Celsius warmer there is an increased chance for more moisture in the atmosphere (greater humidity). The second feature of the forecast further supports a wetter than normal outlook -- probability maps. These special maps are produced by the science team at Extendweather and provide us with insights on the confidence of forecasts. Analysis of the 40 models accumulated over the last ten days from the NOAA CFSv2 database (our refresh interval for all our seasonal forecasts is ten days - the shortest in the industry and thus the freshest) shows that 80 to 100 percent of the models point toward a wetter than average February for most of the North Island and the top third of the South Island. The temperature forecast for the country is also for much warmer than normal temperatures with much of the North and South Islands up an average of 2 degrees Celsius for the month. There could be a heightened risk of facial eczema across a wide area of important dairy, sheep and deer production. Such an outbreak can be limited by the lack of dead matter in pastures so the additional rain in combination with higher temperatures may not lead to a widespread risk. Vigilance will therefore be important in February. Viticulture and stone fruit growers will have to watch for moulds and other pests that thrive in warm and humid conditions. On the up side home gardeners may be able to give the sprinkler a rest and the lawn mowing services will keep up their interactions with their clients as lawns thrive through a traditionally leaner month. Sign up for a free trial and see the latest forecasts and access the image viewer tool too!